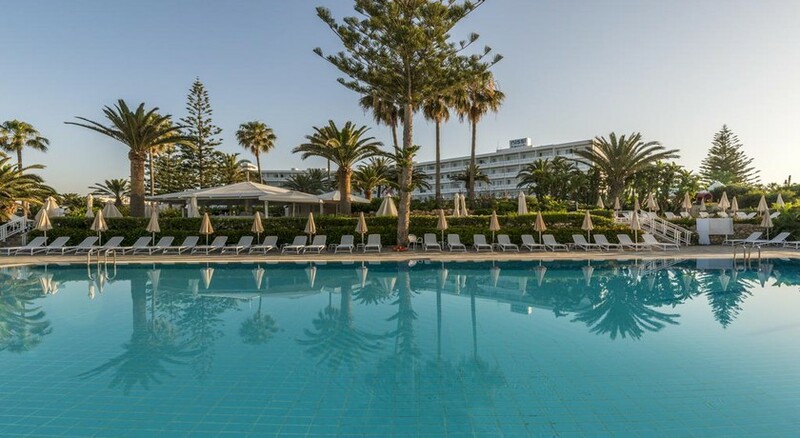 Situated on the iconic Ayia Napa, Nissi Beach Resort is the ideal getaway for all the family. There’s easy access to a variety of fun and exciting island experiences as well as a host of relaxing activities at the hotel too, meaning Nissi Beach Resort offers guests the best of both worlds. Whatever room you choose to stay in, you’ll be met by beautiful sea and garden views, plus light and airy furnishings to maximise the daylight. At Nissi Beach resort, you’ll have easy access to the beach of its namesake as the beautiful white sand, crystal clear waters and ethereal lagoon bay of Nissi Beach are just a short walk away. Or why not stay poolside and treat yourself to a day of lounging? Splash in the pool, book a treatment at Nissi Spa, take the kids to Children’s World or grab a sunbed and a good book. You’ll find a variety of delicious dining venues on-site, with a selection of high-end restaurant and bars fit for refreshments day and night. 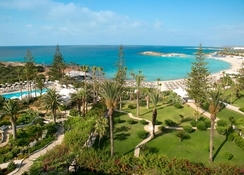 Nissi Beach Resort is located on the south-western part of the island. This beachfront resort is deal for sand and watersports lovers, while there’s easy access to local shopping and restaurants that cater to a variety of tastes are within walking distance, too. The popular Water World Waterpark is just a short taxi drive away as well as fabulous day trips to amazing sites such as Cape Greco National Forest Park. The nearest airport is Larnaca International Airport, approximately 40 minutes from Nissi Beach Resort. 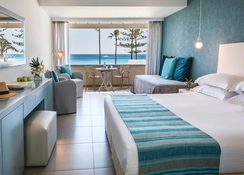 Nissi Beach Resort features 270 beautifully designed rooms across three different yet equally beautiful parts of the hotel, including the main building, the Garden Wing and its Suite and Beach Bungalows. 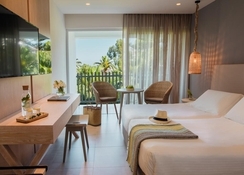 The Bungalows allow for up to four guests and provide stunning sea views and a short walk to Nissi Beach; Sea View Rooms offer guests a beautiful view of Nissi Bay, while Garden View Rooms enable guests to look out over lush green palm trees and adjoins the main building. 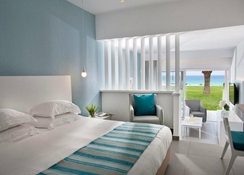 All rooms are tastefully decorated with light colour schemes used throughout making for an airy and uplifting feeling. Rooms feature air-conditioning, tea and coffee making facilities, Wi-Fi, mini-fridge and all the essentials you would expect. When it comes to dining, guests can take their pick from an array of exceptional on-site restaurants and bars. The Ambrosia Restaurant and Terrace delivers a fine-dining experience with international cuisine and themed buffets that range from local Cypriot and Greek dishes, to Italian, Mexican and more. The Taverna Nissi is ideal for those who want to try some fine Mediterranean seafood, and there’s also the Isola Beach Bar, Bacchus Bar and Terrace, Pool Bar and Beach Snack Bar which are open day and night. Outside of the resort, there’s also a wonderful array of easily accessible restaurants. Dione Restaurant is a great spot to try local and international dishes, Flames Restaurants is your ideal stop for Traditional Cypriot cuisine, whilst a host of bar and grills are open late through the night and are great spots to go if you fancy some lighter fare. There’s no shortage of things to do at Nissi Beach Resort. The main attraction, the beach itself is a wonderful spot to take a dip or try your hand at snorkelling or scuba diving. In-resort, Nissi Spa will take care of all your wellness and beauty needs and ensure guests are as relaxed as possible. You can also join the daily entertainment programme and explore activity options to help you make the most of your getaway, from hitting the tennis court, to driving thrill-seeking jet skis and unwinding with some yoga - there’s something for everyone. Kids will love Children’s World, offering a safe space for children aged 4-12 to try a range of great activities such as beach games, water polo and treasure hunts to name but a few. And on an island surrounded by incredible beaches, Nissi Beach Resort has arguably one of the finest on its doorstep, located as it is just 500m away. Cards Accepted: American Express, Visa, MasterCard, Maestro.